there are 61 million German-speaking users. 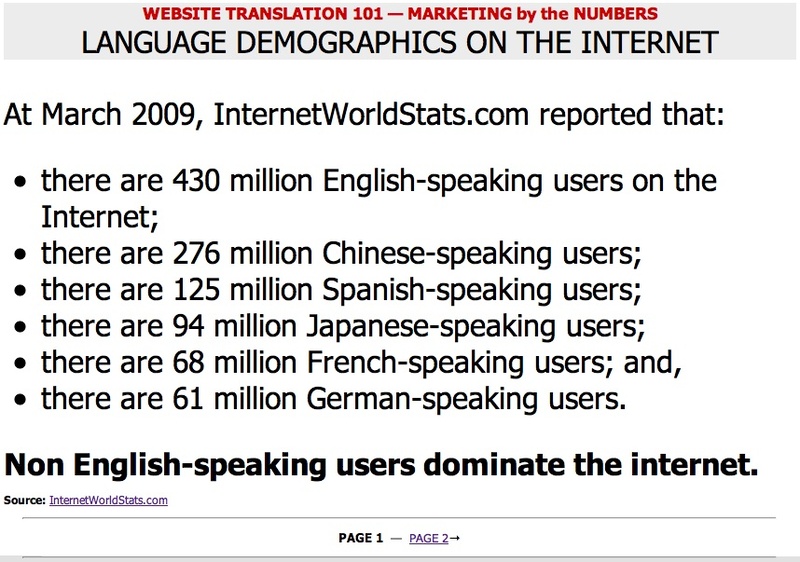 Non English-speaking users dominate the internet. At December 2008, it was estimated that 1.581 billion people had online access, or roughly 24% of the world's population. With penetration of the internet fast approaching maturity in the English language world (73.1% in North America at the end of 2008), future expansion will take place in languages other than English, notably in Asia and South America, where internet penetration at the end of 2008 stood at 17.2% and 29.9% respectively. The rapid adoption of the internet and its advance into so-called emerging markets suggests that future expansion will take place mostly in non-English countries. Users looking for products on-line are far more likely to type the product name into a search engine (28%) rather than go into an engine's "shopping" channel (5%) or click on banner ads (4%). only 10% look past more than three pages. 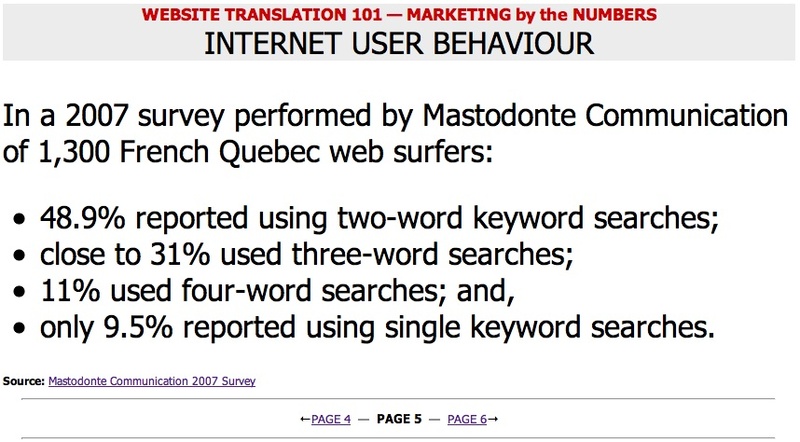 only 9.5% reported using single keyword searches. Website visitors are twice as likely to remain on a site and three times more likely to do business with an organization if the content is available in the visitor's native language. A multilingual website delivers a clear message to the people in the target market that you are sensitive to their language needs. In a word, it's all about stickyness. If your website content were available in the world's top ten languages in use on the internet — including English — your content would be accessible to over 961 million web surfers (approximately 62% of the online user base). FreeTranslationClassifieds.com website for Website Translation resources. 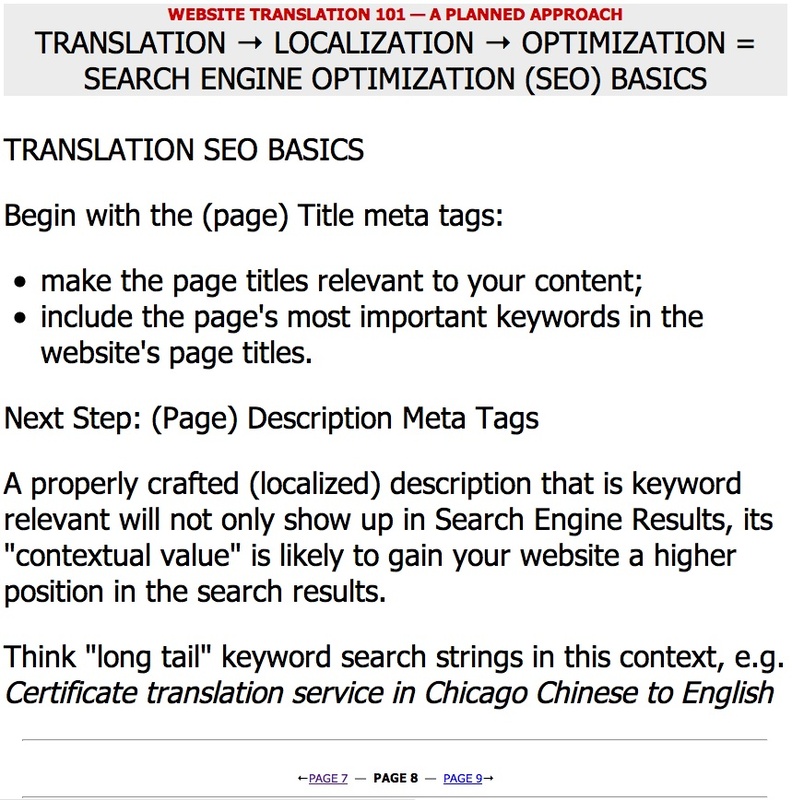 Everything the web has to offer in terms of website translation, localization and search engine optimization reference material that is of particular interest to multilingual website publishers can be found in the FreeTranslationClassifieds.com Website Translation Resource Store. There is little point in having a website translated into Spanish, if it's invisible to people who search the web using Spanish terminology that your website has not been optimized for. include the page's most important keywords in the website's page titles. A properly crafted (localized) description that is keyword relevant will not only show up in Search Engine Results, its "contextual value" is likely to gain your website a higher position in the search results. Think "long tail" keyword search strings, e.g. 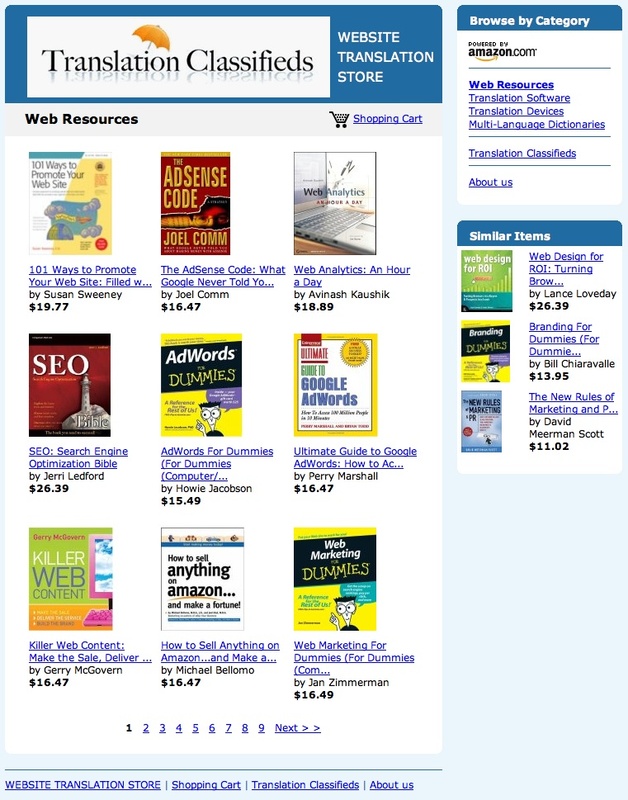 More and more web surfers make their search more specific by way of a two, three, or four-word plus search string, e.g. 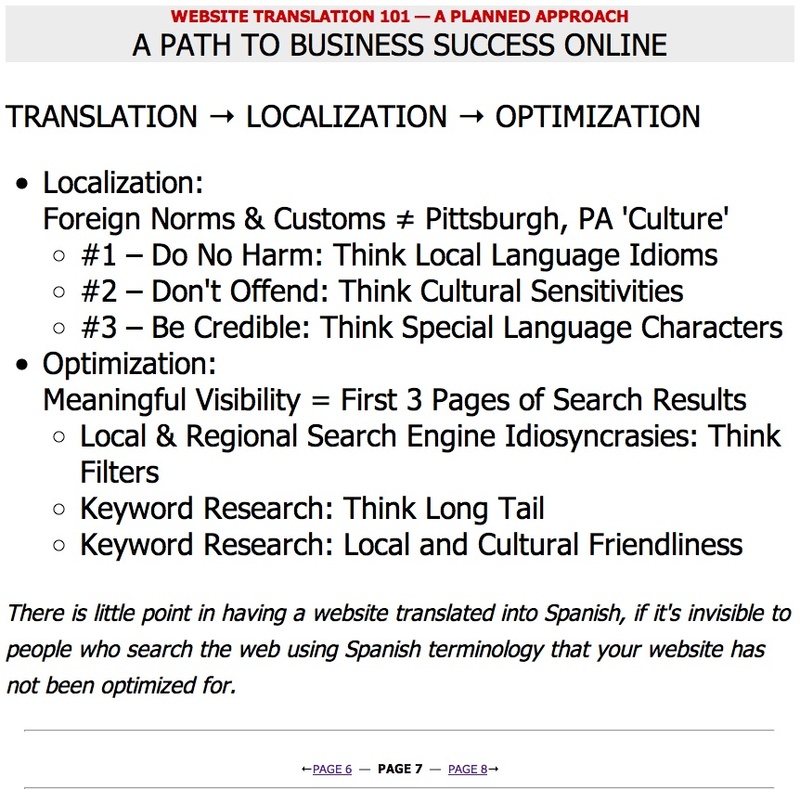 Spanish website localization in Dallas, to generate a more qualitative and manageable number of search results (ideally under 100,000) as opposed to one-word (e.g. localization) or two-word (e.g. 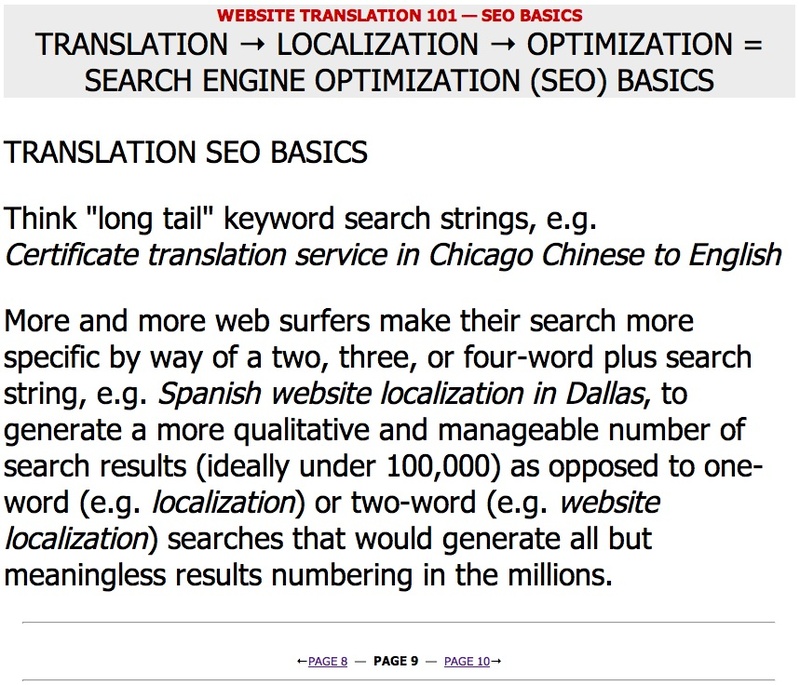 website localization) searches that would generate all but meaningless results numbering in the millions. Section headings that are tagged with H1 and H2 tags will flag content for priority indexing by the Search Engines. 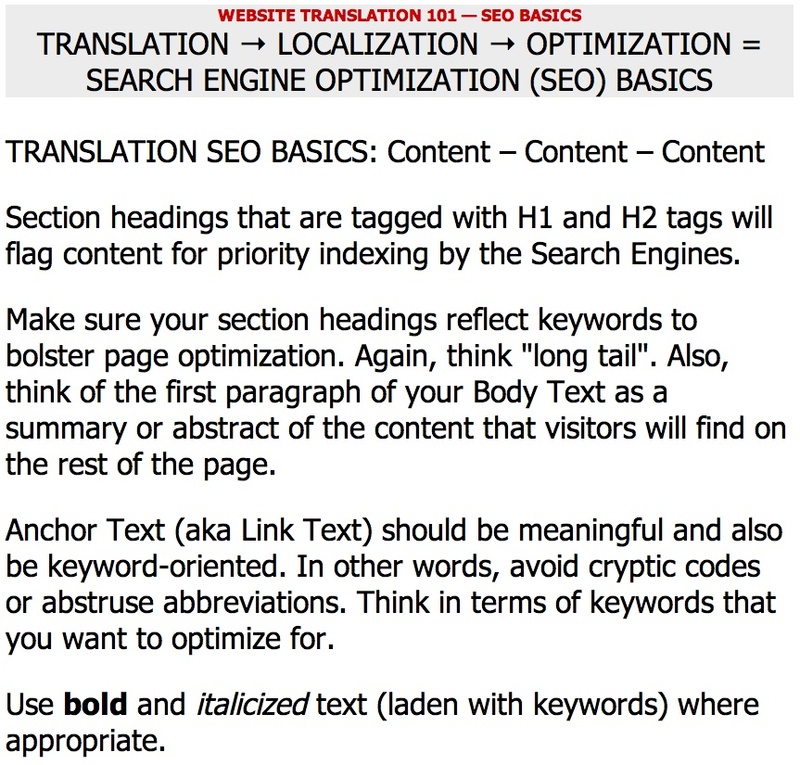 Make sure your section headings reflect keywords to bolster page optimization. Again, think "long tail". Also, think of the first paragraph of your Body Text as a summary or abstract of the content that visitors will find on the rest of the page. Anchor Text (aka Link Text) should be meaningful and also be keyword-oriented. In other words, avoid cryptic codes or abstruse abbreviations. 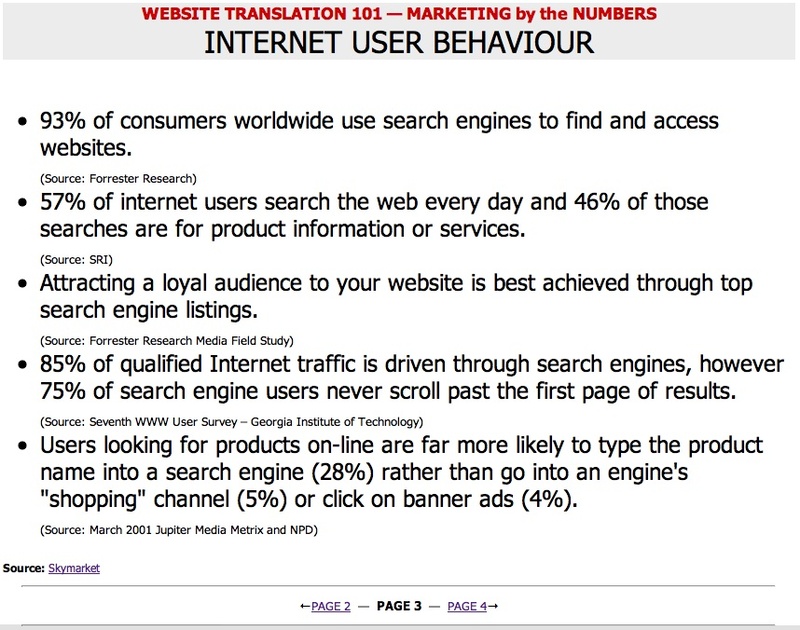 Think in terms of keywords that you want to optimize for. Use bold and italicized text (laden with keywords) where appropriate.